Hilma af Klimt was a Swedish artist, long dead. Her work has remained effectively unknown until now with this museum-wide retrospective at the Guggenheim. Klimt’s work is idiosyncratic, spiritual, mystical, personal. Among her interests were science (in her time, Darwin’s Theory of Natural Selection was recently published - for context of when these works date from) and mystical symbols. Her works searches for meanings, patterns in nature and the codes we can almost see with our eyes but sense in our minds. Klimt uses lavenders and pinks and corals, sometimes. All of these characteristics plus her femaleness have absolutely disqualified her from Art with a capital A. Until now. Rewrite the art history books and include Hilma af Klimt. At the Museum of Art and Design, in the Lollipop Building at Columbus Circle is the work of Cannupa Hanska Luger, a First Nations person who organized this counter protest at Standing Rock (he admits the idea came from Ukraine) The crowd holds mirrors to reflect to the occupying force their images. It turns back on the riot police that they too need the water that the protestors are trying to protect in this citizen action. 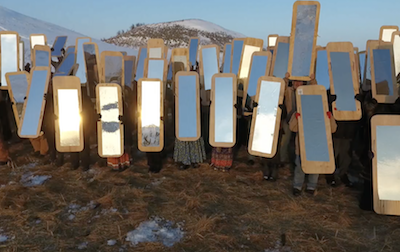 Footage from a drone above the river of mirrors carries the metaphor just as effectively as they shimmer in the sun and flow around the protest.